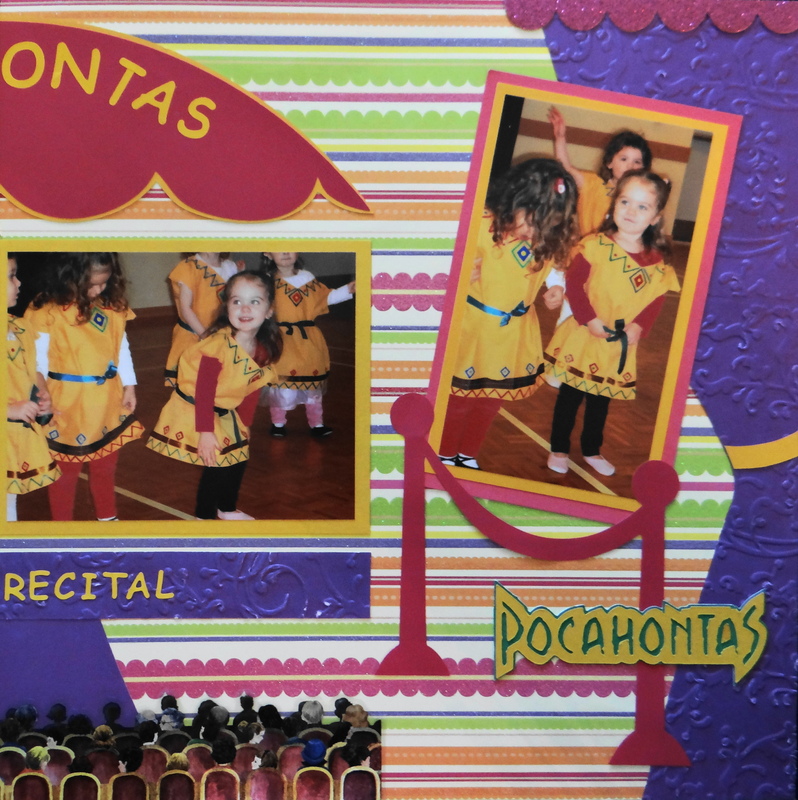 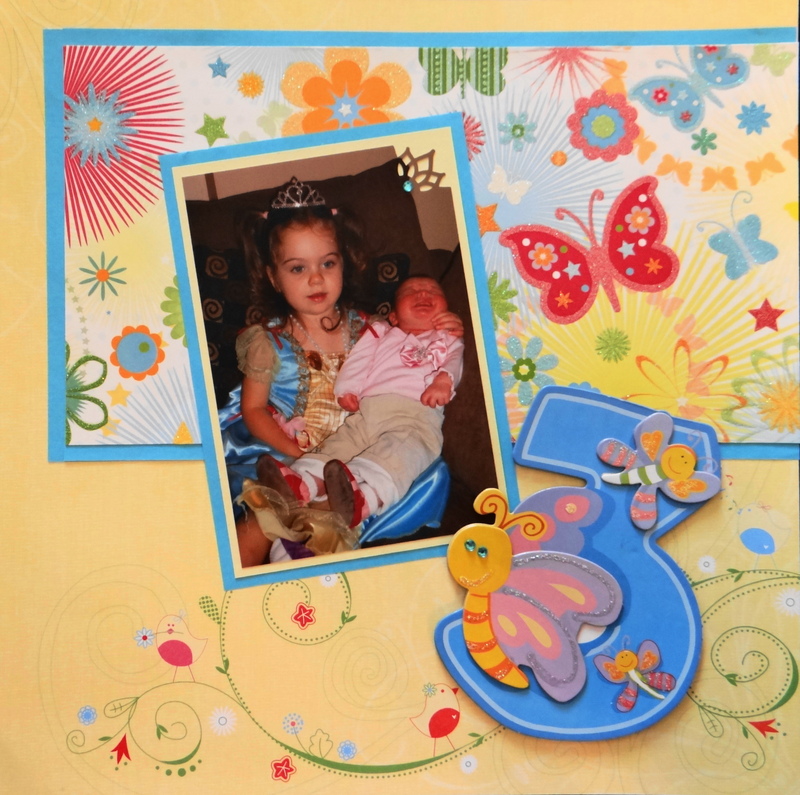 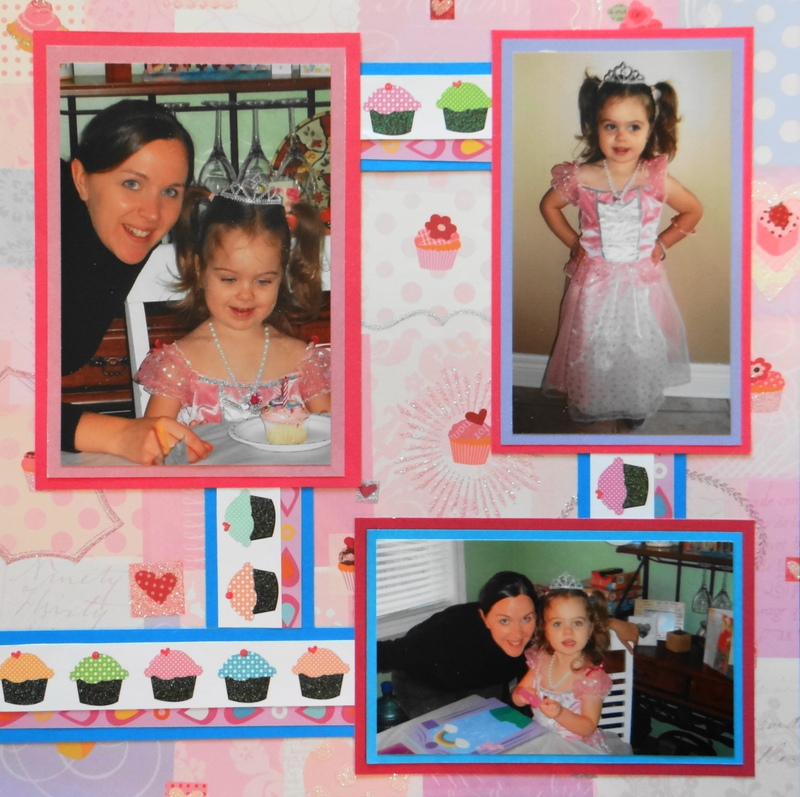 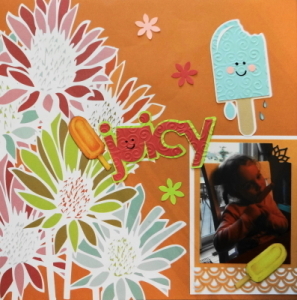 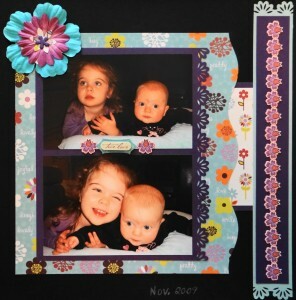 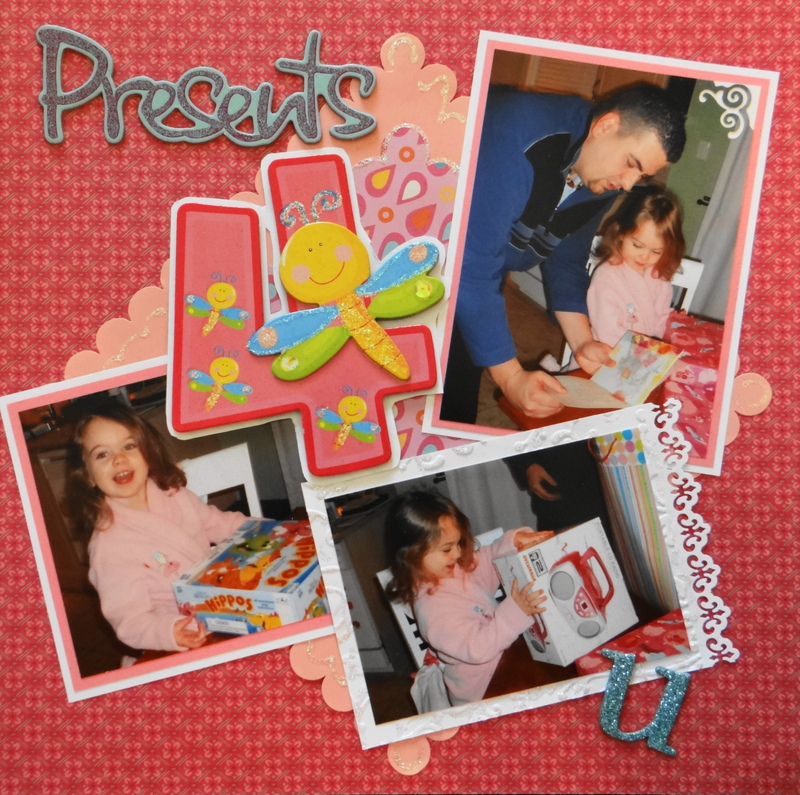 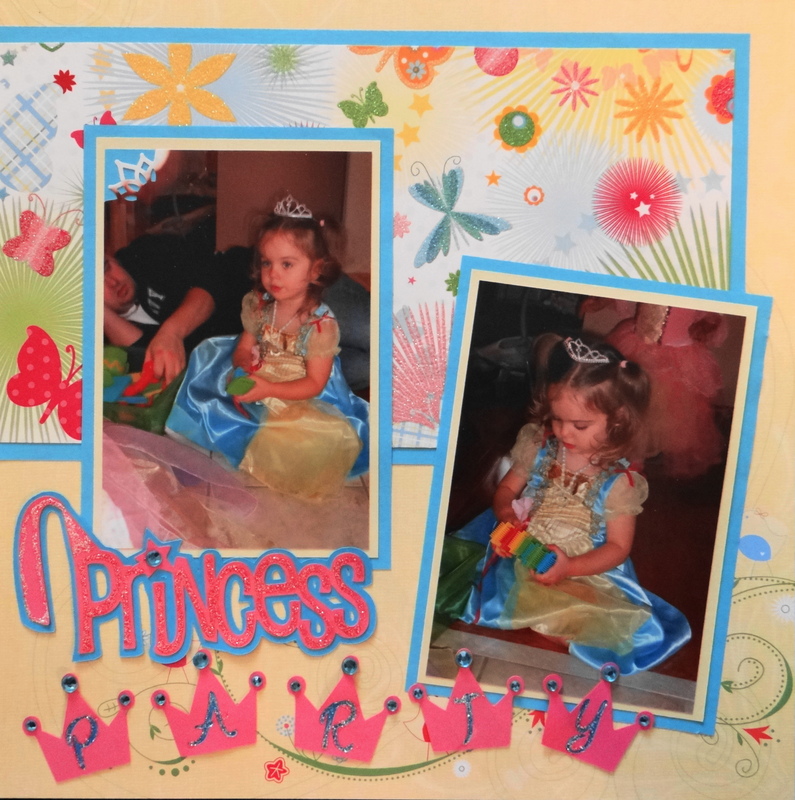 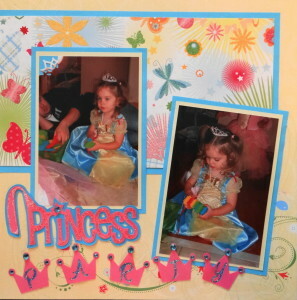 You will find little girl scrapbook ideas in this album and more. Inspiration: The tricycle she is riding and her red outfit. 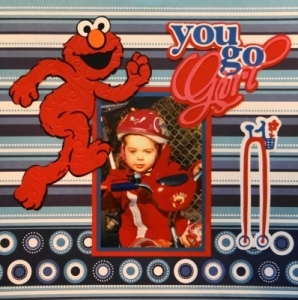 The title “You go Girl” is from the Cricut cartridge Phrases. 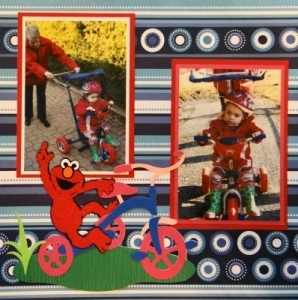 Both Elmo images are from Sesame Street Friends and the tall skinny bike is from Stretch Your Imagination. The trike is from Kate’s ABCs. 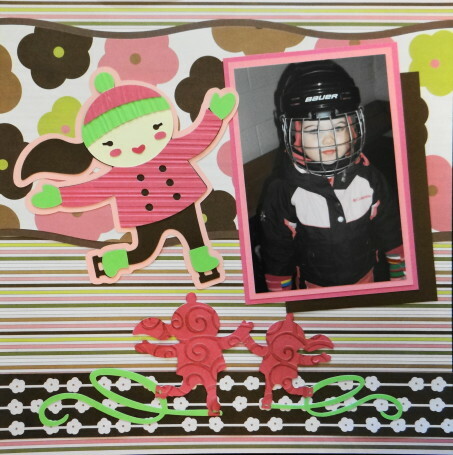 I embossed Elmo and the grass with my Cuttlebug. 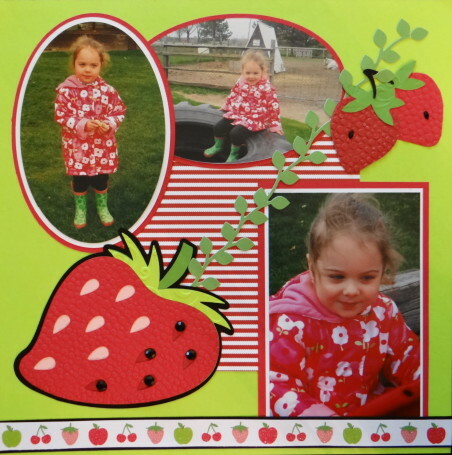 Inspiration: The flower print on her red raincoat and I loved the Berry Sweet title, so that inspired the strawberries. 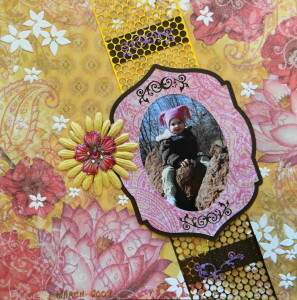 I made a border with the Martha Stewart vine ribbon punch. 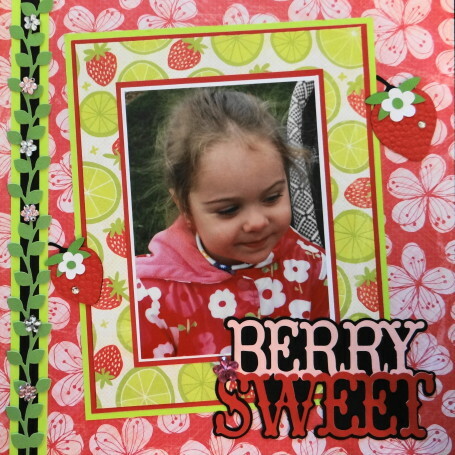 The title “Berry Sweet” and the large strawberry are from Cricut’s Country Life cartridge. 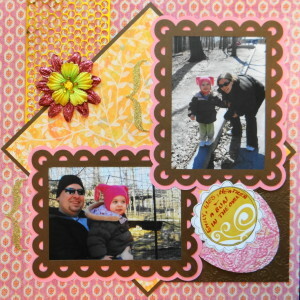 The smaller strawberries are from Preserves. 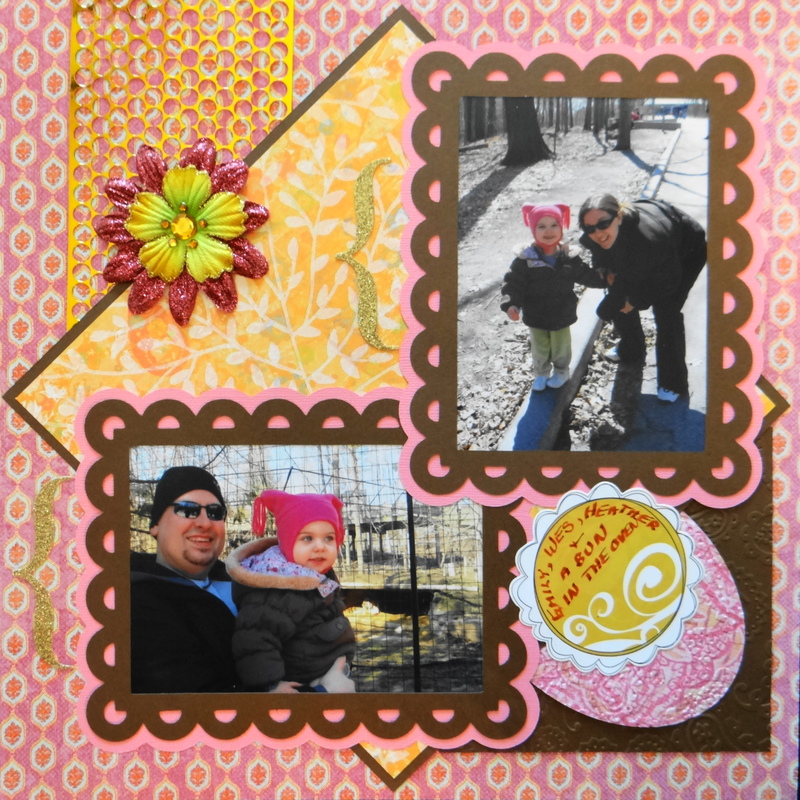 The berries are all embossed to create texture. 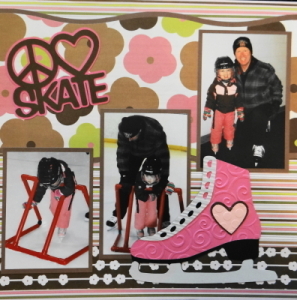 Inspiration:Her first time on skates and her pink & brown snowsuit. 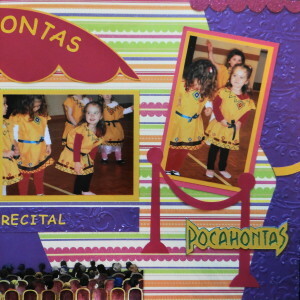 Inspiration: The primary colours of the exerciser gave me an excuse to use my favourite cartridges- anything Disney. 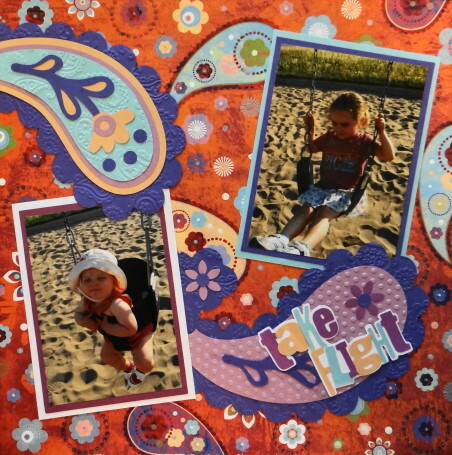 Inspiration: The motion of the swings inspired the paisley swirls. 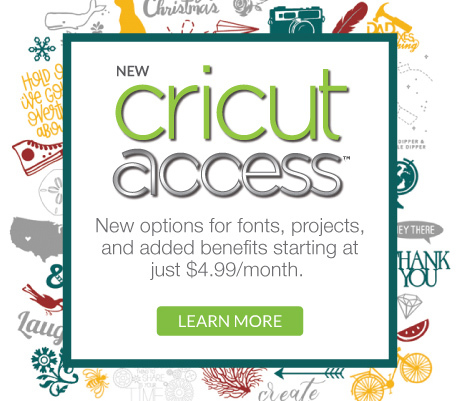 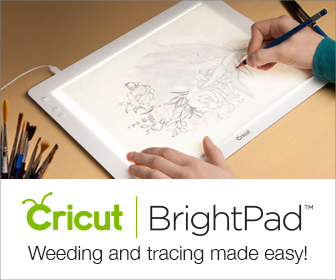 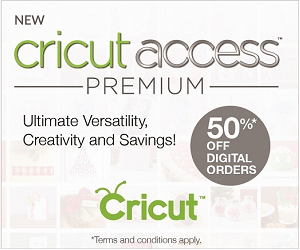 The title “Split” is from Cricut’s Nifty Fifties. 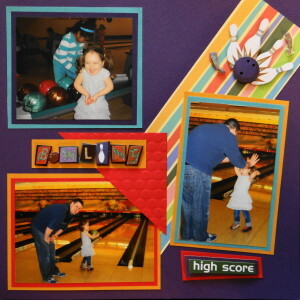 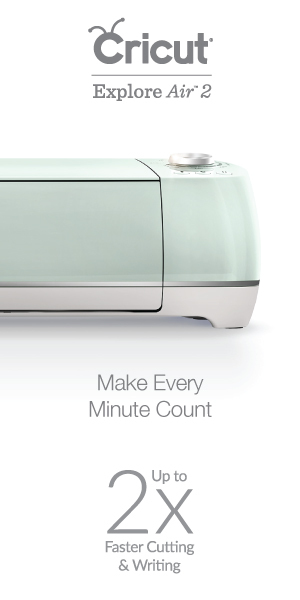 So far, I think this is the only bowling image in Cricut. 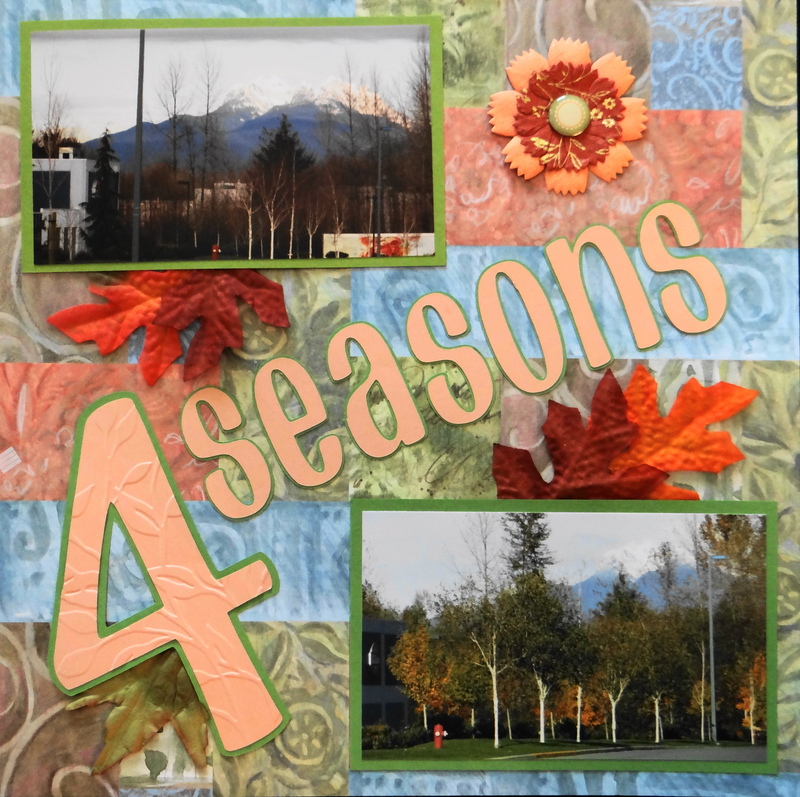 Inspiration: Pictures from all 4 seasons. 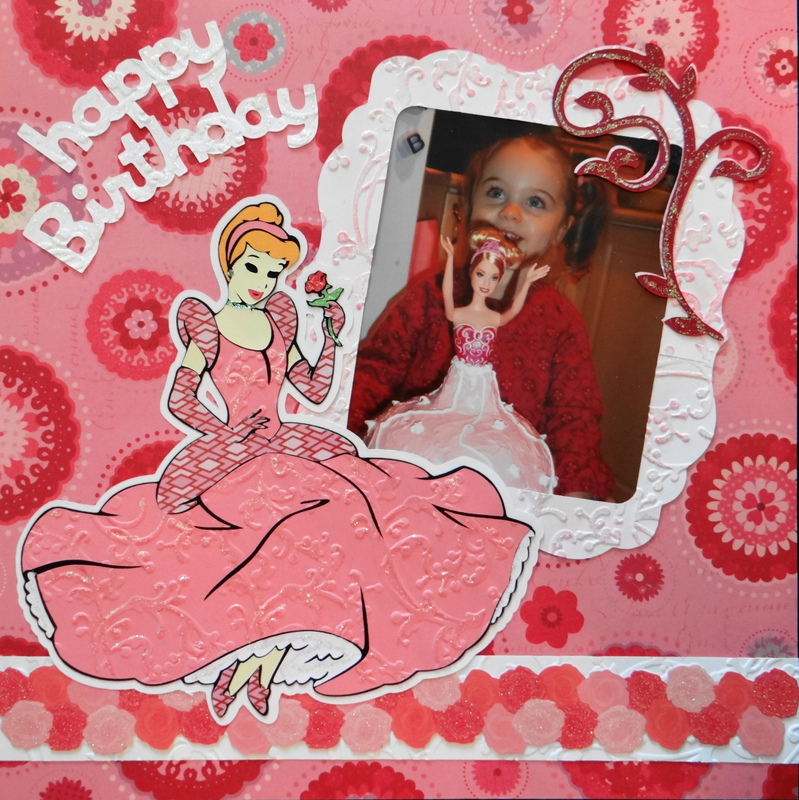 Inspiration: Her 3rd birthday and she is dressed up in a Princess outfit. 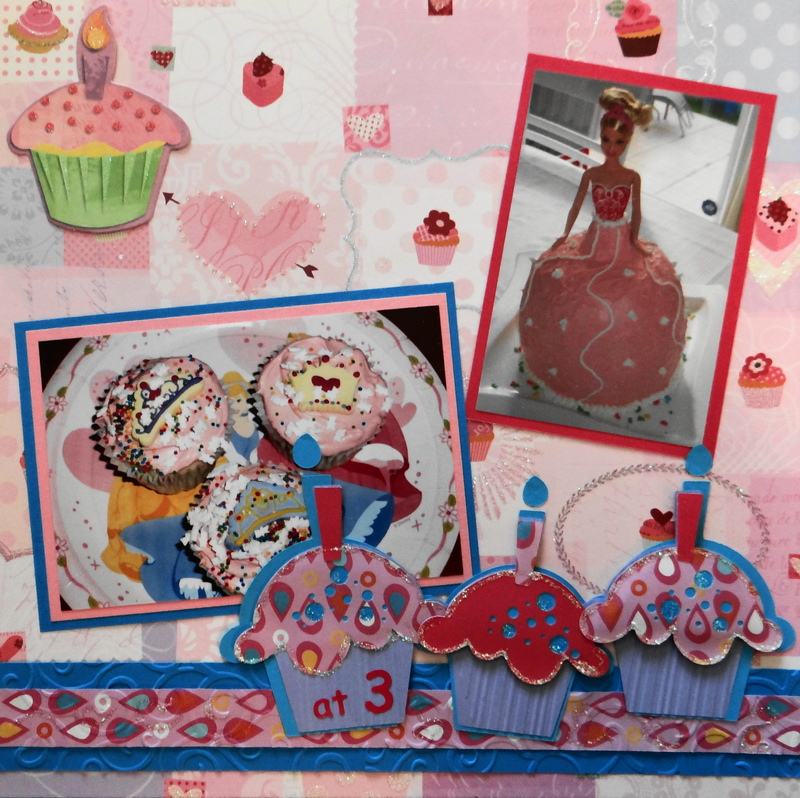 Inspiration: The princess cake cake her mom baked with a Barbie Doll inside it. Inspiration: The birthday party Cupcakes. 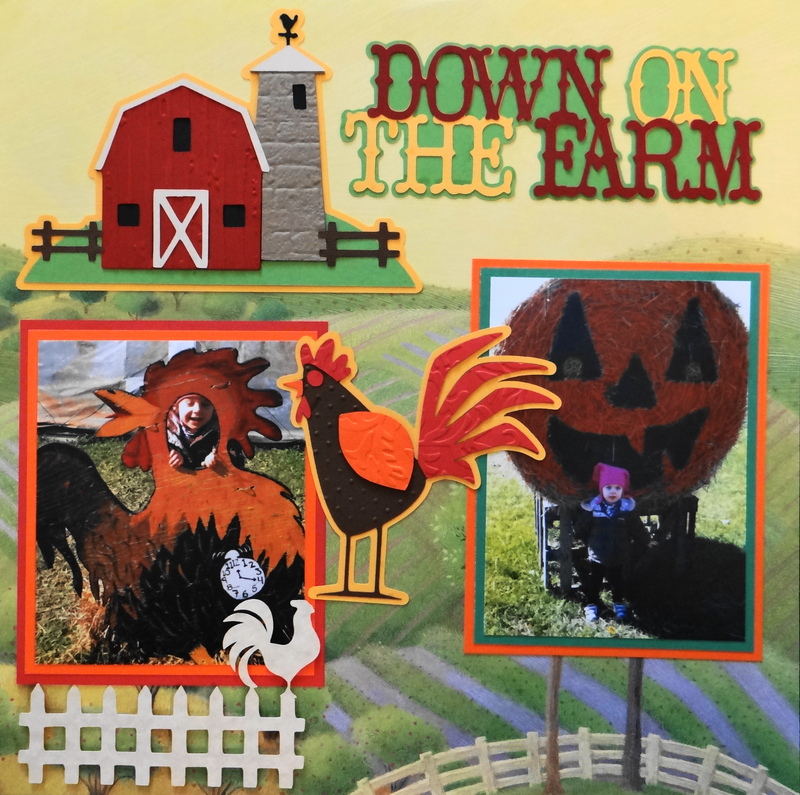 Inspiration: The animals in the photos on this fall trip to visit a farm. 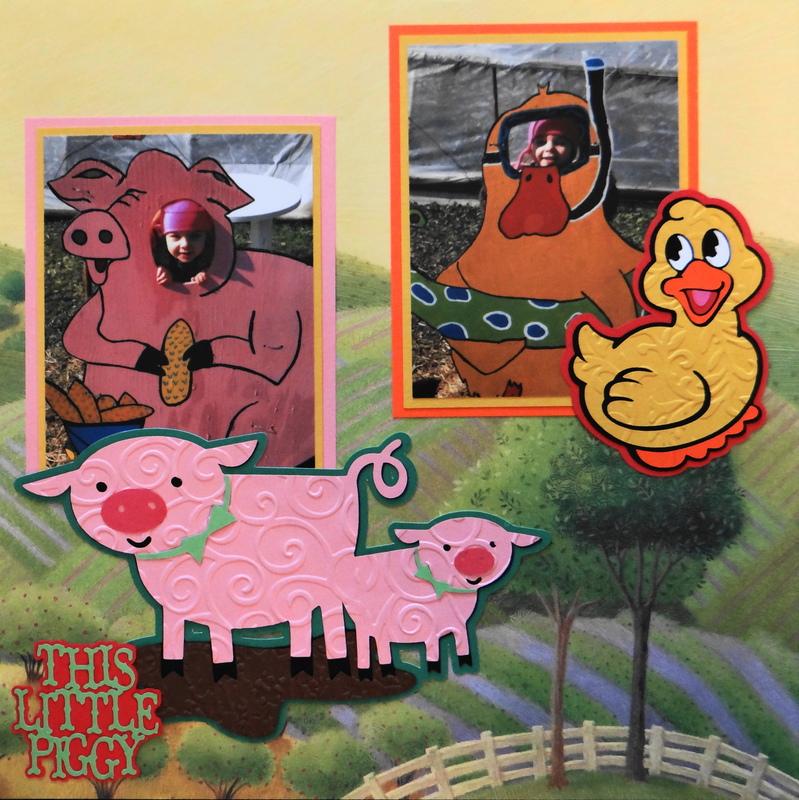 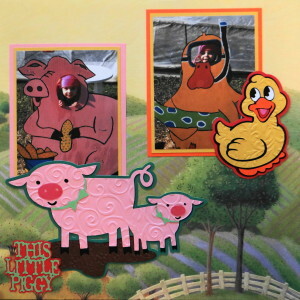 The barn, titles “Down on the Farm” and “This Little Piggy” and pigs are from Cricut cartridge Country Life. 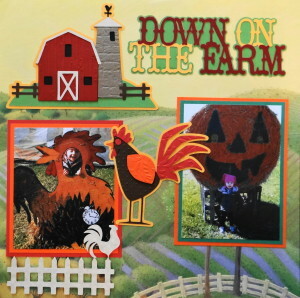 The rooster is from the cartridge From My Kitchen, the one on the fence is a border from Wall Decor and More. 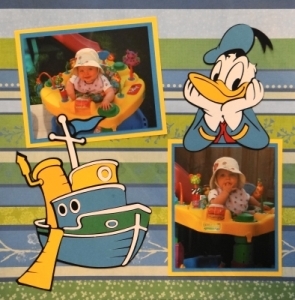 The duck is from Sesame Street Friends. 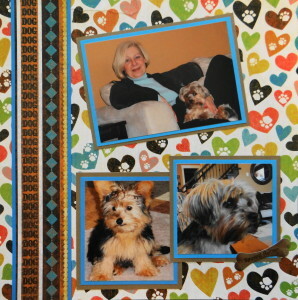 Inspiration: New family Yorkshire puppies and a Sheltie dog. 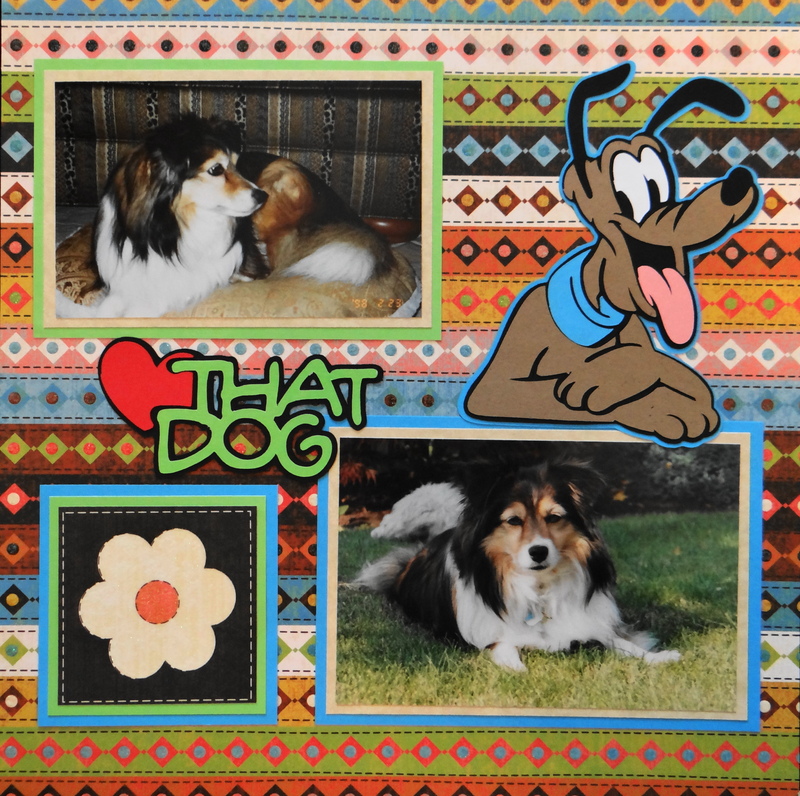 The title “Love That Dog” and dog are from Cricut’s Disney Mickey and Friends. 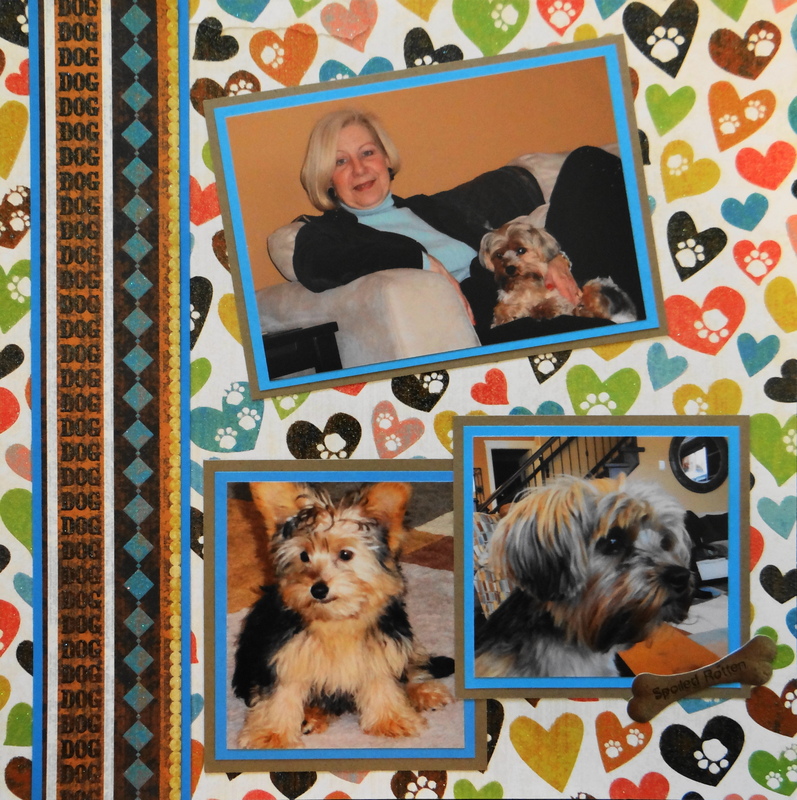 This scrapbook paper is from DCWV The Pet Stack. 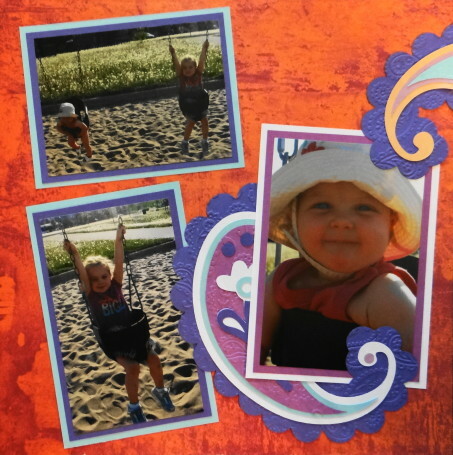 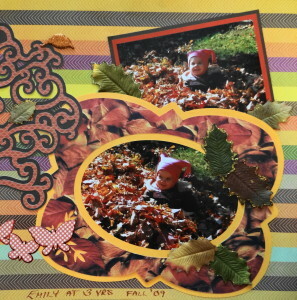 Inspiration: Fall photos of my granddaughter with her pink hat. 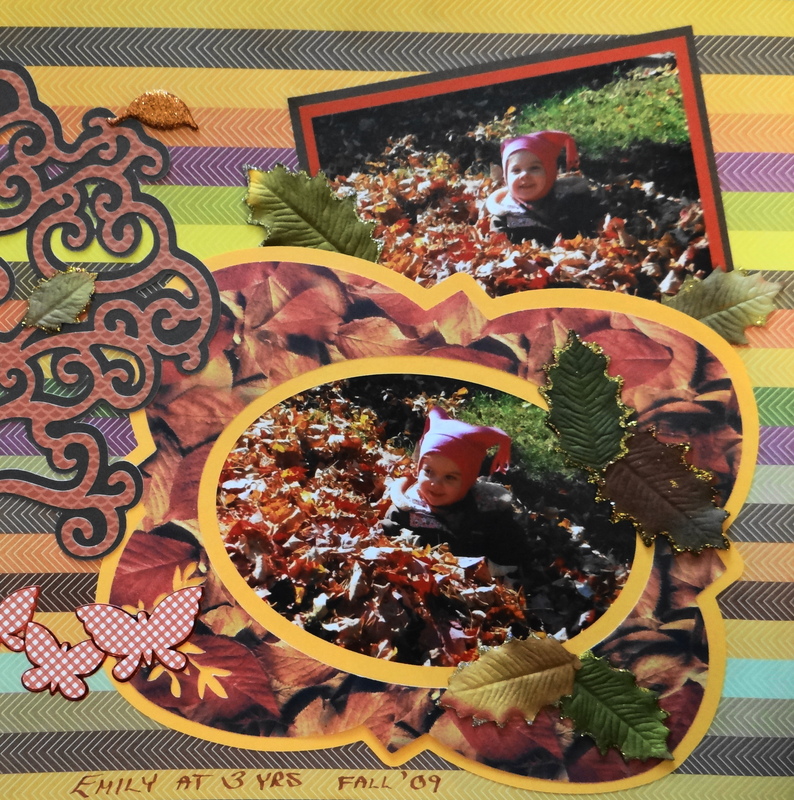 Inspiration: Playing in the fall leaves. 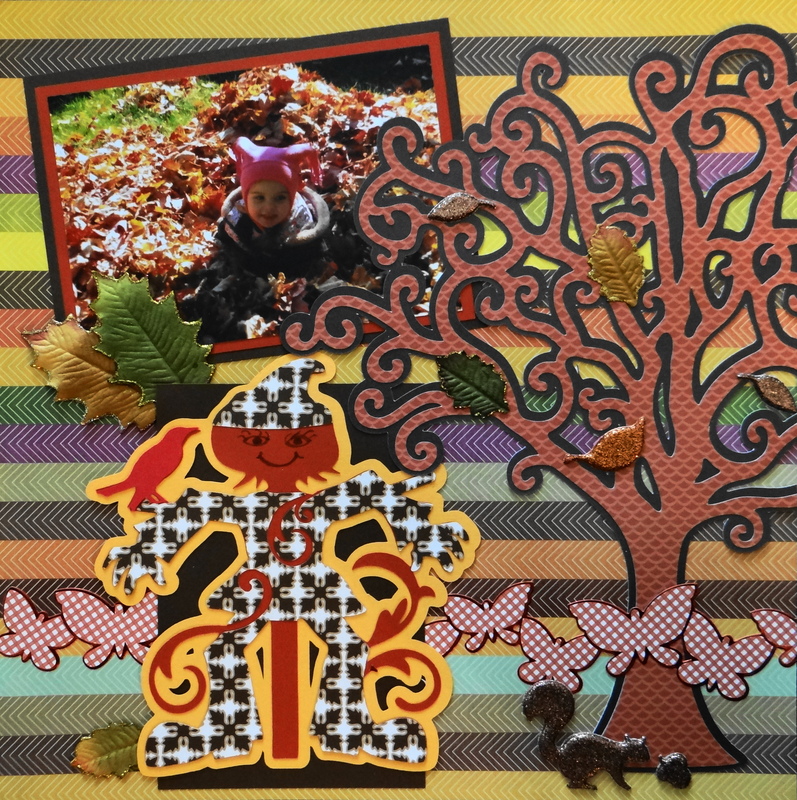 The scarecrow is from Cricut’s Celebrate with a flourish. 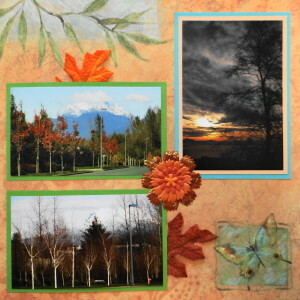 The magnificent tree is from Heritage and the frame is from Elegant Edges. 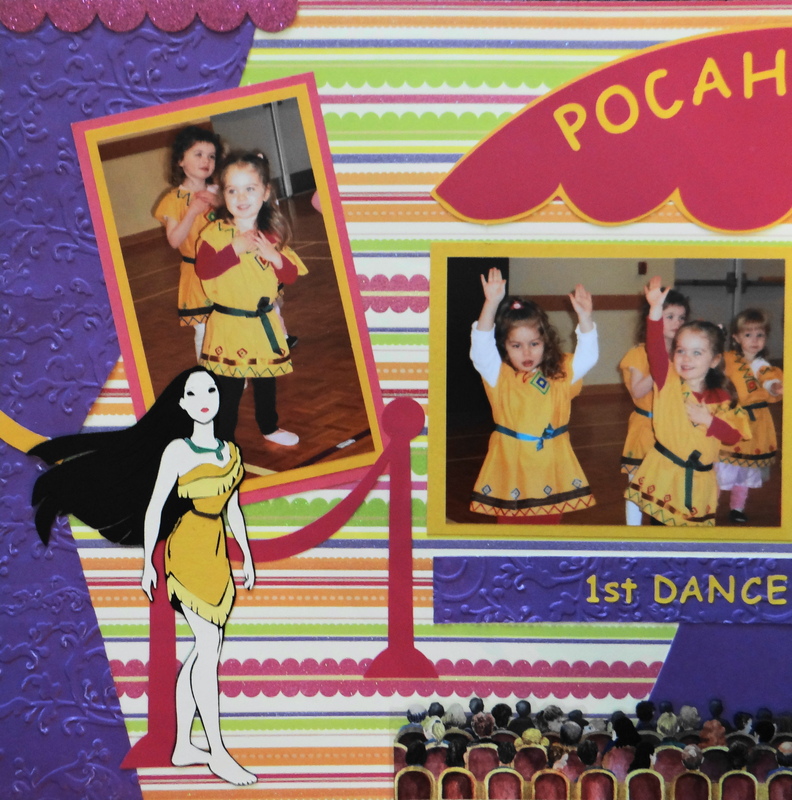 Inspiration: My Little Pocahontas at her first dance recital. 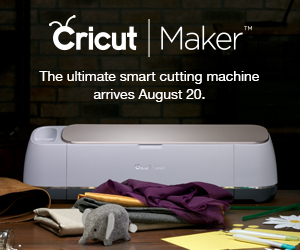 The stage set up is from Cricut’s Formal Occasion. The Pocahontas image and name are from Disney Dreams Come True. 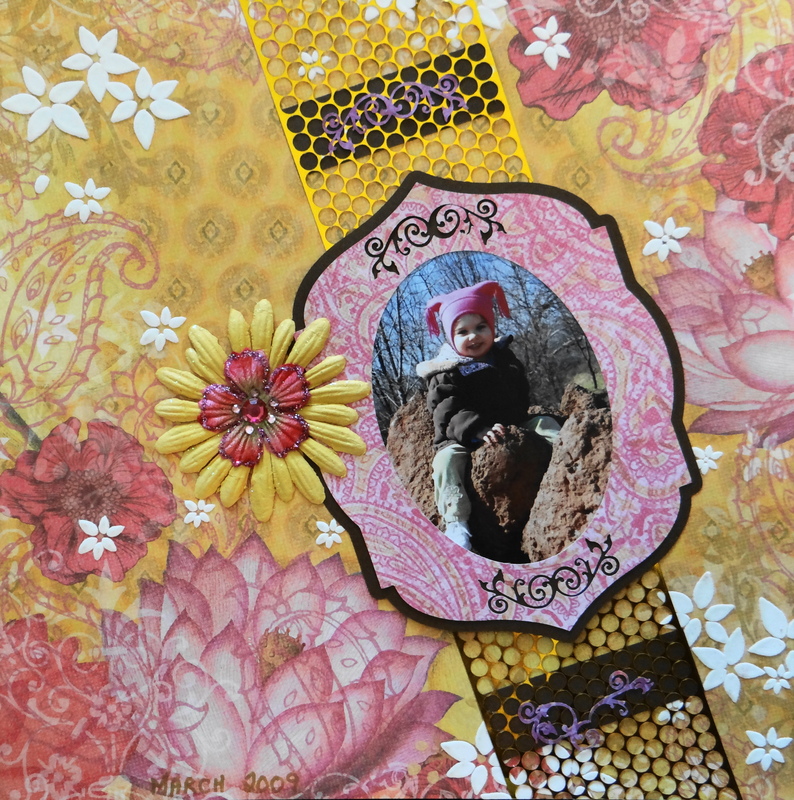 I just free-hand cut the side curtains and embossed them. 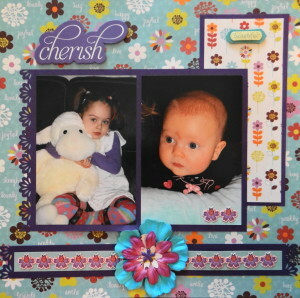 Inspiration: The purple outfits on these loving sisters. 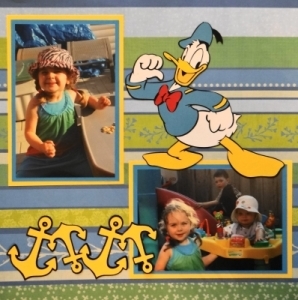 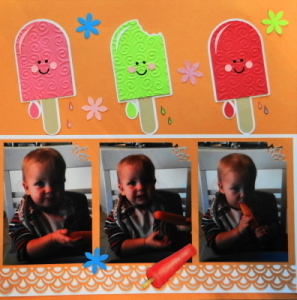 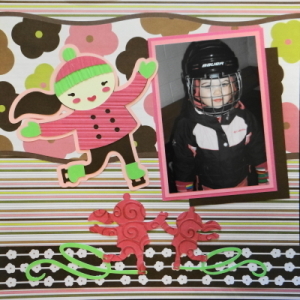 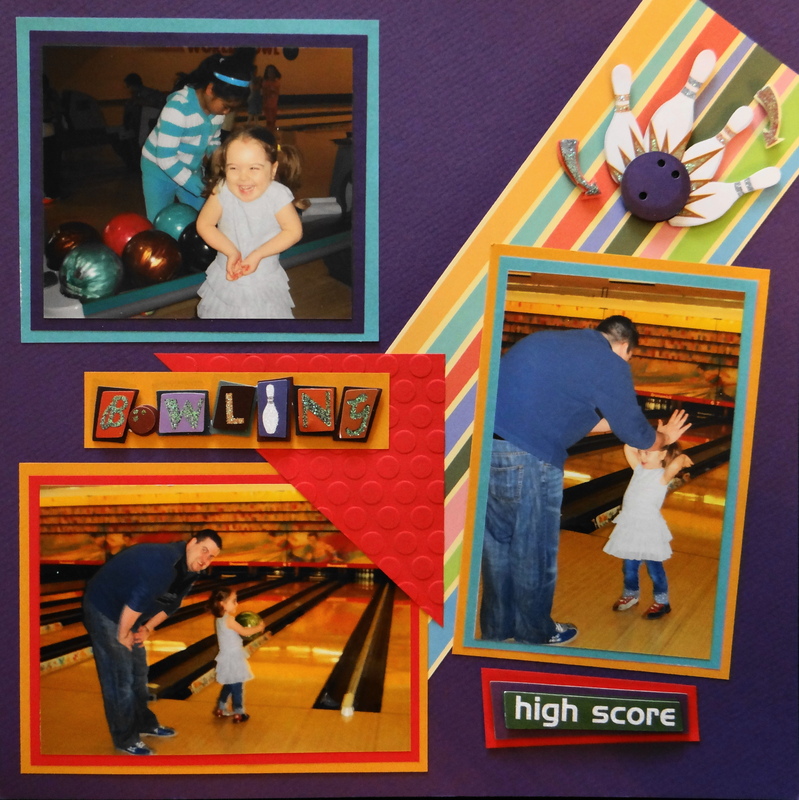 I made the borders and edged the picture with an ek success border punch. Inspiration: The flowers on her dress at this professional photo sitting.